I recently opened questioning on Instagram for my readers to learn more about my upcoming book Lydia Green of Mulberry Glen. They were very happy to help me out and I received some excellent questions! In this blog post, I plan to answer those questions and share my excitement for this magical novel! Lydia Glacier Green never had reason to worry much before. 65,000+. More than twice as long as Honey Butter. Tell us about your protagonist!! The protagonist is (surprise!) Lydia Green. She’s eleven years old and has lived her whole life in a magical, timeless place called Mulberry Glen. She’s deeply thoughtful, often quiet, and considers the forest her home. She loves every aspect of nature and is an aspiring herbalist. What is the world of Lydia Green Like? Lydia Green lives in the Valleylands. 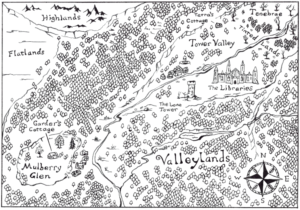 I drew a lot of inspiration from my trips to England to create the Valleylands, especially from the food and culture. I also borrowed the Latin language and architecture from Ancient Rome. Plus a bit of my own imagination. Tell us a bit about your villain. The villain is an invisible force called the Darkness. The Darkness manifests itself in the forest Tenebrae, a place from which no one has ever returned. The darkness starts to take over Lydia’s mind throughout the book, and it represents a lot metaphorically. What inspired you to go from contemporary to fantasy? Well, I was more of a fantasy girl, to begin with. It’s kind of ironic actually because I’d only ever written contemporary once before Honey Butter when I was about five! Other than that, all my work was sci-fi and fantasy. But when inspiration strikes, I follow! The genre usually chooses me, rather than vice versa. What was the hardest part to write/hardest part of the writing process for LGMG? 1. A lot of personal emotion went into it. 2. There’s a ton of metaphorical meaning. 3. All the plot points converge. 1. I do not have the life experience for that yet. 2. My characters are way too young. 3. They’re also a little preoccupied with this whole darkness-taking-over-the-world thing. In general, I’m not a big fan of romance. How big is the world of LGMG? Lydia lives in a part of her world called the Valleylands, but there’s also the Highlands, Flatlands, Icelands, etc. Will we see any magical creatures and/or spells? There aren’t any spells per-say, but there are fairies, Hobgoblins, and Elves. Magic, in this book, is a natural force like wind or rain, people can’t control it. Sometimes books or certain times in history make me want to create a certain world. What’s your inspiration? Is there any chance it will be available in hardcover? Honey Butter has too few pages for me to feel like making a hardcover was worthwhile. But Lydia Green is more than twice as long as Honey Butter, so most likely, yes! What’s your favorite setting in the book? Ooo! It’s got to be the Libraries! The Libraries are huge and beautiful. But besides that… They’re magical. The shelves ‘shift’ to fit the mood of each section and the person who goes there. It’s ridiculously easy to get lost int eh endless shelves, and you might not find your way out for weeks. Who is the Character that you connect with most? A cheesy answer maybe, but I love and connect with all my characters in different ways. That said, Lydia’s struggles are written from some of my own personal experiences, and I connect a lot with her emotionally, even though our personalities are almost opposites. Well, that’s all for now. 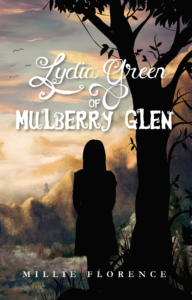 If you want to find out more about Lydia Green of Mulberry Glen, you can subscribe to my newsletter for future sneak peeks, or check out the book’s page here. Ah, that one simple sentence which is the bane of every fantasy writer’s existence. The answer is simpler than you may believe. Many a creme-colored page has explored the subject of truth within fiction, of fantasy within reality. The question, when it comes to writing, is always the same: Should you write what you know? Or should you not? Strangely, however, as far as my reading has taken me at least, no one has ever questioned what that phrase actually means. Write what you know means that you should write about real things in the real world because it makes the story more real. It is assumed to mean the story in its entirety. But what if that’s not its definition at all? Have you ever been afraid? Felt your heart pounding in your chest? Felt your hands go numb with fear as adrenaline thunders in your ears? Have you ever been happy? Felt your smiles stretch over the corners of your lips? Felt your heart expand with warmth and your eyes dance with joy? Have you ever been in love? Felt a rush of pride to your loved one praised? Felt a flood of relief after they experience a moment of danger? Those emotions are real. More real than anything ever could be in this world. You know what it’s like to gaze up at a night sky. You know what it’s like to wonder. You know what it’s like to pull socks onto your feet. You know what it’s like to try and catch the sound of a whisper. You know what it’s like to strike a match and light a candle. You know what baking cookies smell like. You know what it’s like to awake from the land of dreams. Those details are real. They are all just little things, perhaps, but details are what this world is made of. Tiny, real details, like grains of sand, make up the shore of your story. Those overwhelming waves of emotion make up its endless sea. Your imagination does the rest, encasing your story in a vast blue dome of the sky. No. You’ve never fought a dragon. But you know what fear is, don’t you? And what a burn feels like. No. You’ve never received an invitation to a fairy ball. But you know what happiness is, don’t you? And what it’s like to dance. No. You’ve never lept over the edge of a cliff to save someone. But you know what love is, don’t you? And what fearful eyes look like. The room was crowded with tourists and art enthusiasts. The melody of different languages touched my ears. A thousand different smells. A thousand different voices. People clustered about the painting, and between the crush of somber colored coats, here and there, a flicker of yellow met my eyes. My father and I moved through the crowd, keeping close together. And as we reached the surface of the hubbub, I saw the masterpiece. 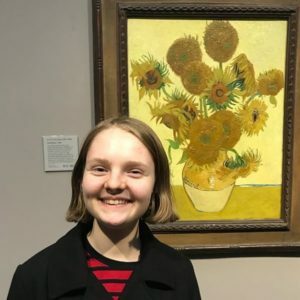 I’m a connoisseur of literature, not art, but Van Gogh’s Sunflowers have always been a favorite of mine among masterpieces of that sort. Owing, in some way, although not only, to the fact that it is entirely my favorite color. But there’s something beautiful and new in seeing any piece of art in person, no matter how many pictures you might see of it online or in books. Paintings are flat pictures, yet it seemed to move out towards me in a way that it never could in a photograph. I could see each brushstroke of bright color where it rose from the canvas. And suddenly it was real. Not a name in a history book, or a still image on my screen, but a real thing that a real person had created. Now in my mind, I see the people coming and going. Watch as they raise their cameras and smartphones, join the crowd for a few moments, before moving on to the unfinished painting of Leonardo Davinci. The bells of Saint Paul call out the hour, once, and then again, and again. Visitors come and go. The sun rises and then begins to fall. Lights come on in the streets outside, the crowds dwindle, disperse, evaporate. Amber rays of the setting sun sweep patterns over the gallery’s staircases through their few small windows. The doors are locked, the museum closes, night casts its cloak over the rooftops and tosses its glittering stars into the sky. The windows of houses and apartments become small squares of gold in the velvet dusk. Inside the gallery, those bright yellow flowers are alone. Where once there was a babble of voices, now there are only the silver whispers of silence. Where once the bright overhead lights glowed, now there is gentle darkness. Where once there was a sea of onlookers, now there is nothing. Those bright golden blossoms are alone. Likely, few think of them. And yet still they hang upon the wall, with all the pride and beauty as they did before. Their value does not dim simply because the lights do. Their loveliness does not decrease simply because the crowds do. At the Realm Makers Conference, which I attended last July, the leader of our continuing session asked a question which I will never forget. The room elapsed into half thoughtful, half stubborn silence. There were scattered mummers of “second option” around the room. Contrary to what society will tell you, attention does not equal value. Value is something that is determined personally within your own heart and mind. Something that only you can decide. So now, here I sit, as ripe January sunshine pours over my keyboard, as the theme music from my younger sibling’s TV show drifts up from the basement, I write on. Perhaps this book will be a roaring success, perhaps it will be a complete flop. But to me, it will always be a masterpiece, long after the cover is closed. Hello everyone! Today I have a very special post for you! I’ll be interviewing one of my fellow young author friends, J. C.! I first met her, and another author friend, Riley, last July at the Realm Makers conference. We had an amazing time and became fast friends. Since then, we’ve kept up through FaceTime to talk, laugh, and encourage each other. 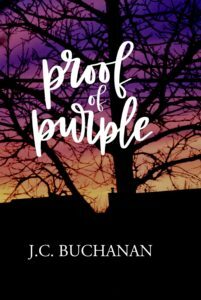 Just recently, J.C. has published her fourth book, Proof of Purple! You can check it out, along with all her other books, here. Now, on to you J. C.! 1. What started you on your writing journey? When I was 5, I told my mom I was going to publish a book and put it in the library. I didn’t realize that scribbled pieces of paper stapled together weren’t library quality 🙂 When I was 9, I decided I actually wanted to make that happen, and by the time I was 12, The Hidden Amethyst was released! 2. What was the first piece of creative writing you wrote? The first “book” that I wrote was called The Boy Who Got Covered in Macaroni. It was for my brother, and it was about a boy who ate too fast and his food exploded. 3. How ’serious’ is your writing? Do you consider it a career or just a hobby? I’ve always been serious about my writing. As I said, I decided to publish a book when I was 5, and that desire just never left! I know beyond a shadow of a doubt this is a gift God has given me, and I want to do the absolute most that I can with it. 4. Who would you recommend your most recent book, Proof of Purple to? 5. Describe Proof of Purple, in three words. 6. How has your life and personal experiences entwined with the subjects of your books? While writing my books, I definitely try to draw on my own emotional experiences to understand my characters better. In my first three books, there aren’t many connections to my actual life experiences (unless you count that in The Hidden Amethyst, I named every character after one of my friends;). However, Proof of Purple does correlate with my personal experiences to the extent that friendships are extremely important to me, and like my characters, I definitely feel it when tension arises. 7. What do you consider, the ‘key to success’ in writing? Don’t be ashamed of your writing, and let others read it! I used to be so protective of my writing and didn’t want to show anyone, and it got me in trouble because I’d get months into a story without seeing that it wasn’t going to work in the long run. This book, with help from a few amazing friends, I’ve learned to open up and it has been so, so crucial. In my experience, when you’re confident in your writing, not embarrassed about it, and willing to let others offer insight, you can get so much farther than had you worked alone. 8. Were there any differences in your writing process between the four books you’ve written? Slightly, but honestly, not much. I always do a super-rough first draft, and then basically just keep revising and writing new drafts until I’m happy. The only big thing I can think of is I didn’t outline The Hidden Amethyst, but I outlined You’ll Be Like Faye and never looked back. 9. Which of your books is the saddest? Most exciting? Funniest? I’ve had many people tell me they cried at the end of YBLF, so that’s probably the saddest. The Hidden Amethyst wins the award for the funniest in my mind, but probably only because I was so young when I wrote it that today I have to choose whether to cringe or laugh, and it’s just easier to laugh at it. But realistically, it’s probably the most exciting. It’s one hundred percent action/adventure. 10. What’s in your ‘author’s toolkit’? One of the most influential writing books for me has been Gail Carson Levine’s “Writing Magic.” I also employ Pinterest as my main “author tool”. Music is key—I have to listen to music to write. Beyond that…my imagination and a keyboard do the rest. 11. What’s the coolest author related experience that’s ever happened to you? When The Hidden Amethyst came out, I took a risk and sent a copy to my favorite author at the time, Suzanne LaFleur, just for fun (who is still one of my favorite authors). A few months later, she personally mailed me a hardcover copy of her newest book with a note inside about how much she enjoyed reading my book. It was the best day of my life. 12. What can we expect to see from you next? 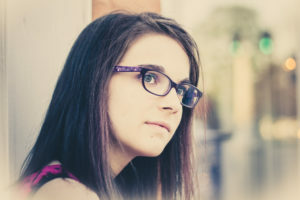 J. C. Buchanan is an 18-year-old homeschooler, Christ follower, avid reader, and writer. 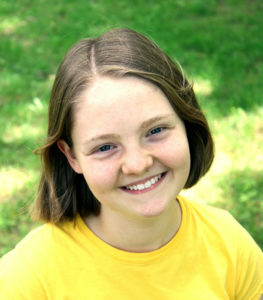 Her first book, The Hidden Amethyst, came out when she was 12, followed by You’ll Be Like Faye when she was 14. She also has released a short novella sequel to You’ll Be Like Faye, entitled Far Away Faye. Proof of Purple is her third full-length novel, but she plans on many more to come. Follow her online at jcbuchanan.com.